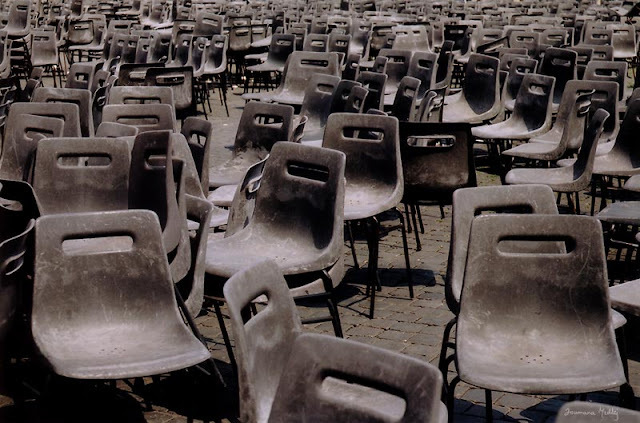 - Italian streets have impossible names such as Circonvallazione Gianicolense, Via Ferdinando Palasciano, and Stefano Buccapaduli, doubtlessly meant to dissuade the hordes of tourists from venturing beyond sites that are meant to be touristic. - Rome hardly has a subway: only two lines, simply because everytime they try to dig, they run into more ruins and have to stop everything. Fortunately, they have this awesome tramway. However, there are no station names. You are expected to figure out where you are and where you get off. The Italian railways will do everything it can to make sure that you do not figure it out. 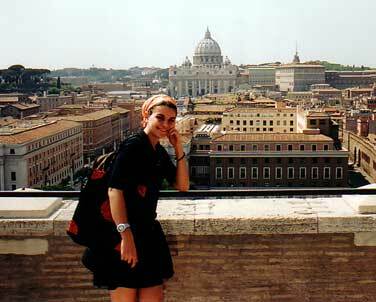 - There are 3 things that Rome is full of: cats, accordeon-armed Gypsies, and at the time of my visit, the colourful peace flags hanging from windows and balconies as on the right. The government being supportive of the war in Iraq, had forbidden their display in governmental buildings. In response a TV presentator commented: "Let them not tell us where we can't put the flags, and we won't tell them where they can put the mast". 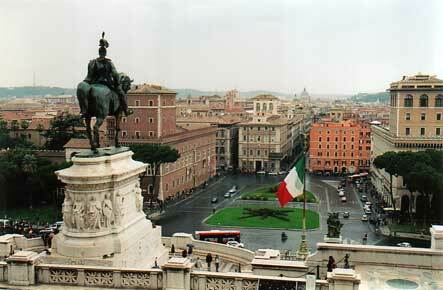 I took the tramway to the end of the line and heart of the city, Piazza Venezia, from which the arteries branch out. I walked around the area in shock -- it was like walking unexpectedly into a room where 20 historical figures are sitting having tea. In particular the first monument I was confronted with was the overwhelming Monument to Vittori-Emmanuele II, behind which the Roman city stretches out. Soon I ran away back home to bury myself in my guidebook: before attempting the conquest, I would have to figure out what I was looking at and if I could aim to see it all, at all. The Monument to Vittori-Emmanuele II, aka "the typewriter"
That evening my friend Konrad and I had a lovely walk through Trastevere, the loveliest neighborhood in all of Rome: a maze of old narrow streets crowded by stalls in the evening, webbing their way around the beautiful church of Sta Maria in Trastevere. 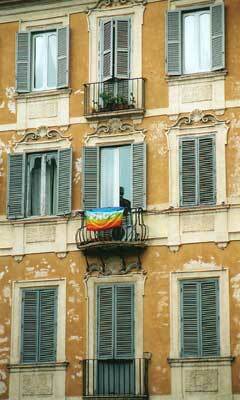 Trastevere seems to be the one place in the city that is neither rotten by tourists nor hopelessly uninteresting. The church itself is said to have been founded in the 220s by Pope St Callisto, which would make it the city's first official Christian building, but the present church is a reconstruction dating from the 1130s. 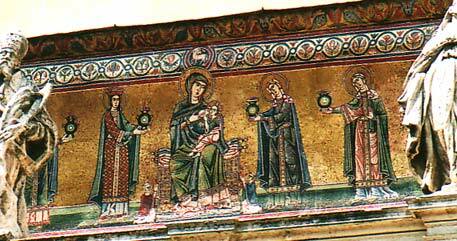 The apse presents an unusual and sweet mosaic where Christ has an arm around his mother's shoulders. We walked on back to the river and up to something Konrad wanted me to first see by night. He took me to the mouth of a bridge and stopped us there as I blinked in disbelief. 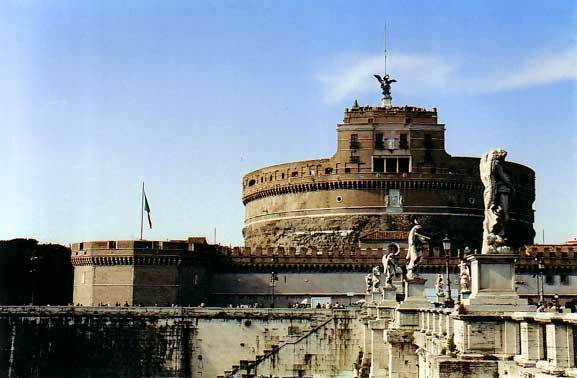 I was looking at Castel Sant' Angelo, and the only adjective that seemed worthy of the sight was "stupendous". 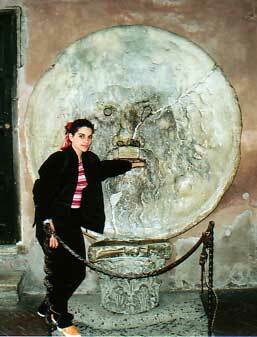 I had never seen anything like it: it is round, rough and monumental, and it guards the Vatican carefully aligned beyond it. We returned to the Castel for a full visit. This used to be the mausoleum of Emperor Hadrian, so that it was a mound, and that's what gives the present fortress its cylindrical shape. 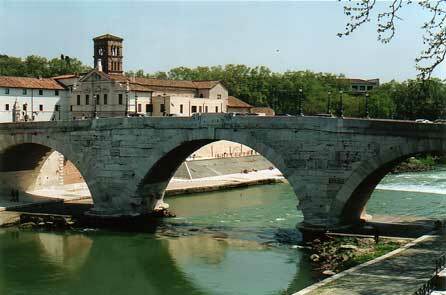 It was only a wretched ruin when the Popes took it over and built the castel over it to become their residence. 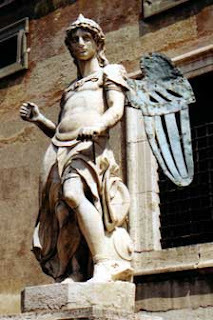 Nowadays it is crowned with a statue of Archangel Michael, which along with the name of the place derives from the following story: in the year 590, during a procession organized to obtain the end to an epidemics of plague, St Gregory the Great saw on top of the monument Archangel Michael sheathing his sword. This vision announced the end of the plague. I was so disoriented I didn't realize that it was St Peter's I was staring at from the rooftop. On the other side of the vista I could see another dome, strangely flat and sober. 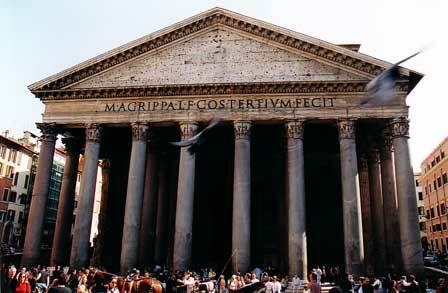 None other than the Pantheon, our next destination. 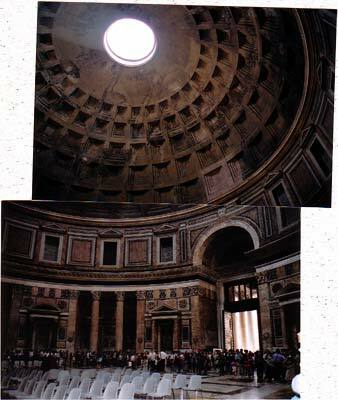 One cannot praise the Pantheon enough; its rotunda inspired all the domes that followed in both Roman Empires and all the cultures that were influenced by them. It is large, simple, clean, and just perfect. Stepping into the large circular room, one just feels dizzy as the perfect geometric articulation of the dome creates movement in the mind, not to mention the gaping eye (9m in diameter!) allowing light to flood in, but amazingly, not rain (or so I was told). One of its many original features is that its decoration comes entirely from its structure – no applied ornaments, making it incredibly modern. 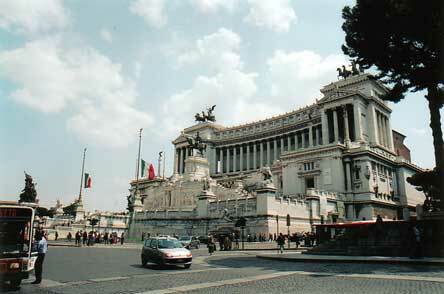 The building's proportions were sought out by Bramante for the design of St Peter, where he wanted to "put the Pantheon on the basilica of Constantine". Once dedicated to all the Roman gods, the Pantheon is now the church of Sta Maria degli Martiri, and has been since the year 609 when pope Bonifaccio IV consecrated it into a Christian place of cult. It is to this intervention that we owe the monument's perfect preservation, as along the centuries other pagan structures were routinely used as sources of free construction materials. Unfortunately it was much better preserved 3 centuries ago. Its famous bronze statues had also been preserved in their original condition, but in the 17th century, by order of Pope Urban VIII (of the Barberini lineage), they were melted down: the sculptor Bernini was working on St Peter's baldaquin, and had run out of bronze. Maddening, I know, and this idiocy inspired a scathing epigram at the time: Quod non fecerunt Barbari, fecerunt Barberini ("What the Barbarians won't do, the Barberinis will!"). Let me also report the fact that Bernini, decidedly not my favorite Renaissance artist, had added belltowers on either side of the Pantheon. They became known as "Bernini's donkey ears" and were removed in the 19th century. Raphael was buried in the Pantheon in accordance to his own wishes, and his touching epitaph can be read on the wall: "While Raphael was alive, Mother Nature feared that he might outdo her. Now that he is dead, Mother Nature fears that she may die, too." We ate and had amazing ice cream by the Pantheon before wandering towards Piazza Navona -- a long and narrow square overtaken by artists and bordered by shops of a higher quality than most I saw in Rome. 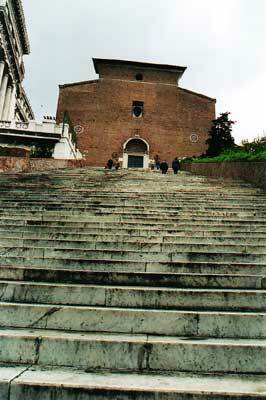 Konrad then took me up a big flight of stairs to the church of Sta Maria in Aracoeli. According to medieval legend, the Sibyl of Tibur predicted to Augustus the arrival of the Messiah. 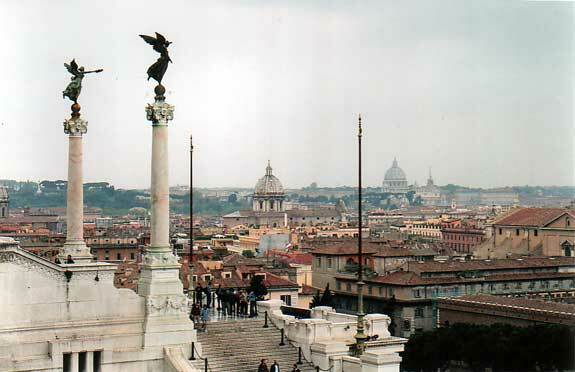 Aracoeli stands in the place of the fortress where the prediction took place, and contains the Ara Coeli erected by the Emperor on the spot of the encounter. The original church was built in the 6th century, and this one is a 1250 reconstruction endowed with beautiful stained glass windows. A very striking statue of the Virgin, extremely modern in forms (and of modern craftsmanship anyway), stands on the Ara Coeli. The church also contains a wooden effigy of baby Jesus with an interesting folk legend attached to it. It was sculpted in olive wood in Jerusalem in the 15th century by a craftsman who ran out of paint, and so an Angel finished it for him. It was taken to Italy by a monk but its presence on the ship caused such terrible storms that he had to throw it overboard -- however, the statue finished the journey on its own, in the ship's wake. A woman stole it from the church, but then fell so gravely ill she confessed and returned it... Now known as Santo Bambino di Aracoeli, it is considered miraculous and has been recently crowned. Being disoriented again, I never noticed Aracoeli's back facade looks out upon the very fori I had wandered in two days earlier. I thought we were in a whole other part of town, and here I suddenly find myself at the bottom of the huge Monument. 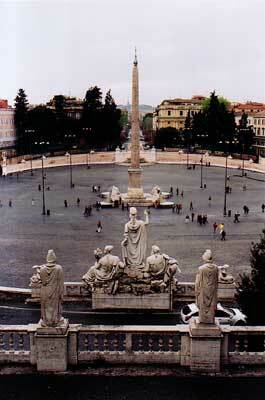 We walked up the Corso from there, the Roman equivalent of Oxford Street in London, all the way to the Piazza del Popolo which has one of Ramses II's obelisks in its center (grrrr) and is bordered by a large gate that marks the northern end of the city centre. Above the Piazza there is a park, the Pincio, and following it back we arrived at Sta Maria Trinità dei Monti, one of the 5 French churches of Rome, foudned by Charles VIII in 1495. 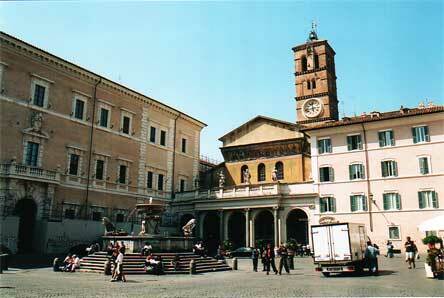 What makes this church stand out is that it looks down upon a flight of stairs that flows onto Piazza di Spagna. It was like being at the AUB main gate: people just sitting there having their coffee and newspapers on the stairs, or watching people walk by. I wanted to dedicate a whole day to the Vatican so we went back to look for our last sight of the day, the church of San Ignazio. Almost by mistake we stumbled into Rome's most beautiful church, Sta Maria Sopra Minerva (named this way because it was built on top of a temple to the goddess Minerva). 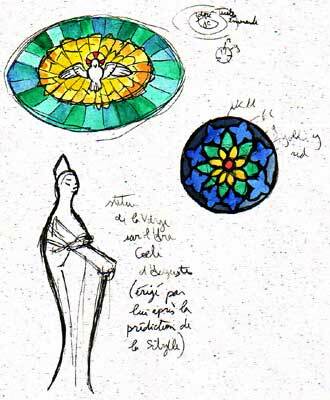 It's the city's only Gothic church and its stained glass windows are gorgeous compositions of abstract, delicately colored motifs. What infuriated me was that some had broken panes. How can anyone let such a monument remain untended like this? 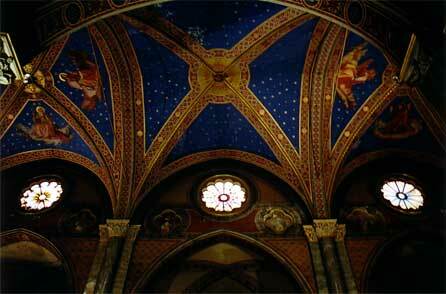 San Ignazio turned out to be definitely not my taste in churches. I hate baroque paintings.